Lesser Appleworm LAW -- 1st LAW flight begins around: May 11, Wednesday. Peak trap catch: May 21. 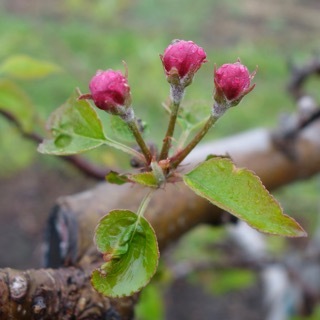 17-May, 2016 (Tuesday) UMass Fruit Twilight Meeting at Park Hill Orchard, 82 Park Hill Rd., Easthampton, MA. 5:30 PM. 1 pesticide credit will be offered. Light dinner/refreshments will be served. $20 meeting fee. Contact: Jon Clements, 413-478-7219. Pre-registration is not necessary. 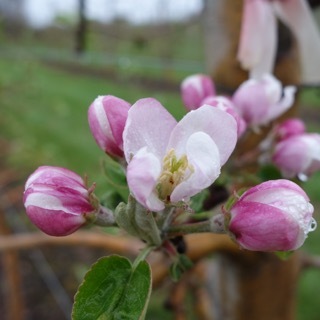 18-May, 2016 (Wednesday) UMass Fruit Twilight Meeting at Sholan Farms, 1125 Pleasant St., Leominster, MA. 5:30 PM. 1 pesticide credit will be offered. Light dinner/refreshments will be served. $20 meeting fee. Contact: Jon Clements, 413-478-7219. Pre-registration is not necessary. 19-May, 2016 (Thursday) RIFGA Twilight Meeting, Phantom Farm, 2920 Diamond Hill Road, Cumberland, RI. 5:30 PM. 2 pesticide credits will be offered. Light dinner/refreshments will be served. $20 meeting fee (free for RIFGA members). Pre-registration is not necessary. Contact: Heather Faubert, 401-874-2967. • OK, we are in a holding pattern. "Suspended animation" says one grower. 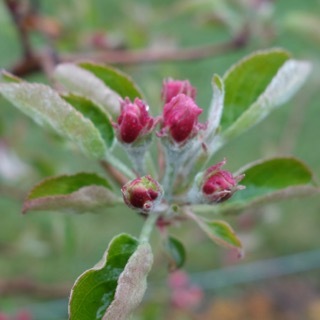 Apple buds are opening (slowly) and I am seeing many buds that are compromised, however, many look OK too. See below. We could use some warmer and sunnier weather now to move things along. (Wake me up when it's over). If you had not already figured it out, we are in the midst of a major apple scab infection period (scabocalypse?). Several fungicide applications will be necessary in the next week. I would make life easy for myself by using: Captan + mancozeb + Inspire. Lets get the boring stuff out of the way first. The weekly spore counts are as follows: In the funnel trap we counted 453 ascospores, the squash mounts show 57% maturity and in the petri plate we counted 135ascospores. 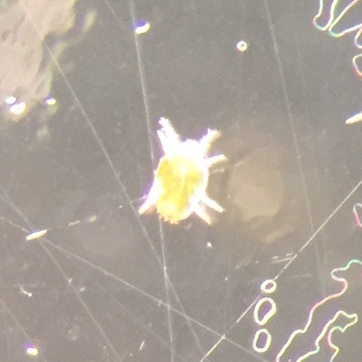 Here is the interesting number though: in the two-fan trap, pulled this morning, we counted 709 ascospores in ten random fields of view (see pict below). Remember that big huge infection event we have been talking about? This is it! And it doesn’t appear to be over yet. According to the forecast for Belchertown, it will continue to be wet and cool through the rest of the week. This is the kind of combined event that you save those post-infection spray applications for! I’d love to tell you that its all smooth sailing from here, but, we do have the potential for a few more infection events of this magnitude before we can consider primary scab season to be over. If there is one thing you learn in introductory plant pathology, it’s that fungi that attack plants revel in wet weather. In dry weather, they have to shut down and bide their time. So it is with apple scab. As you know, unless you’ve been successful in ignoring us for the past couple of years, Jon, Liz and I have taken an interest in the different forecast models that predict periods of high risk for diseases and other pest problems. We are particularly interested in a scab prediction model out of the Netherlands called RIMpro. For many, at first look, RIMpro seems like more information than you want to deal with. And RIMpro does have a lot of information in it. 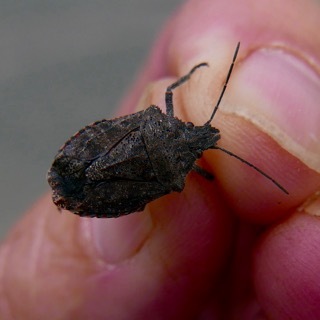 The name comes from the Relative Infection Measure Program, the infection being scab infection. Basically, the higher the RIM value, the higher the risk of a scab infection. In the picture below is a RIMpro graph for today, May 3, for the UMass Cold Spring Orchard. 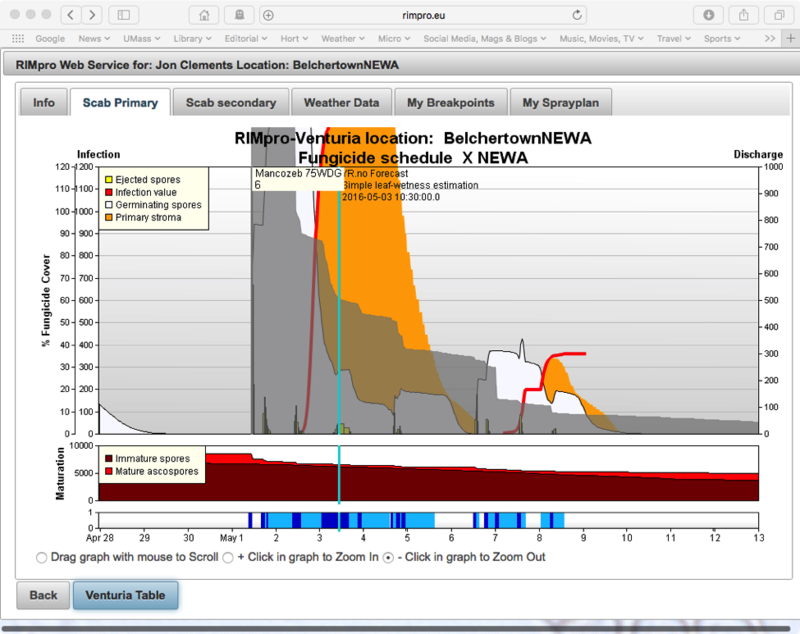 (Don’t confuse the NEWA name with the product – it means RIMpro is using the data we use in NEWA.) The the red line shows the RIM value; ignore the other stuff for now. The left axis of the graph has the values, which as the name says, are relative. One working guideline we use is that when the red line goes over 300, then there is a good chance of infection in a clean orchard. 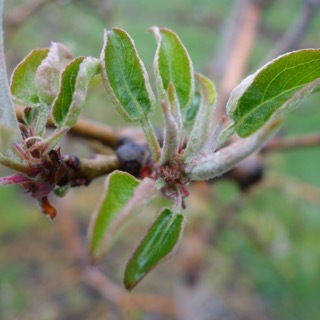 In high inoculum orchards, then any RIM value indicates risk of infection. Notice that since mid-April, there has been little to no risk of infection in clean blocks. In fact, since green tip except for April 23, RIM values have been well below 100, indicating very low infection risk. The bar at the bottom of the graph shows light and dark blue bands, indicating leaf wetness and rain. Each blue band is a wetting period. Naturally, infections happen when it rains. Then there’s May 1 through next Monday. The blue-green vertical line indicates the present, today. The rain for the last couple of days triggered a major infection, with RIM values near 1,900. I’m told by our European and Canadian colleagues that’s a lot. 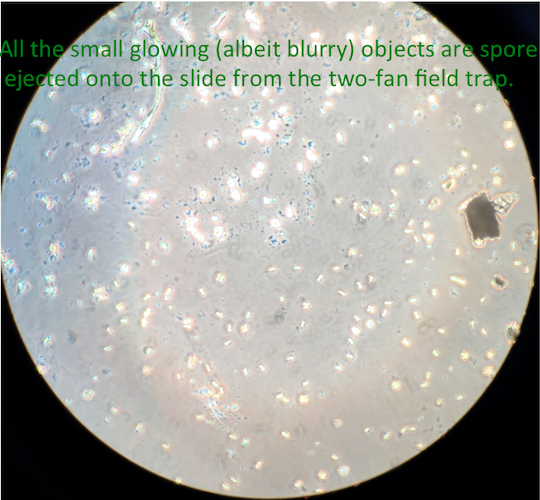 In fact, this is exactly what Liz saw in her ascospore observations. In the outdoor trap, we saw tremendous numbers of ascospores. In fact, we have to show them to you. This is just one, microscopic part of spores we trapped from a set of about 15 leaves. RIMpro saw this coming. The next picture shows a RIMpro screen from Saturday, April 30. While the forecast RIM value is not as high as what actually occurred, it’s very high. We decided to put on a full rate of a protectant spray, Captan plus mancozeb, “captozeb”, in our test block on Sunday, before the rain. RIMpro shows when ascospores were released, when they are germinating, and when they have actually infected leaves. The small, upright bars colored yellow and black show spore release, in the white areas. 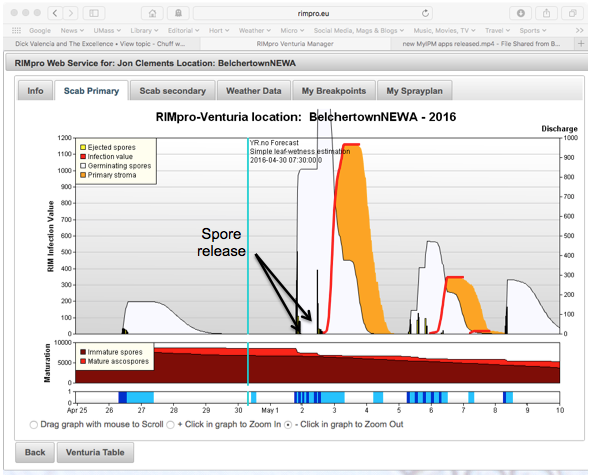 In addition, in the box with the red areas above the wetting periods and below the main graph, RIMpro estimates the number of immature and mature ascospores at any time during the season. Here, the bright red shows a large percentage of the season’s spores were ready to go on May 1. The darker red shows that there are still a lot of immature spores that will continue to develop over the next couple of weeks. Over the last three days, approximately 20% of the seasons ascospore load was released. 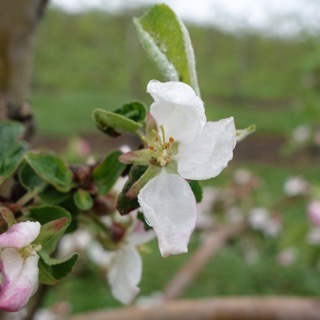 The large white areas show when the released spores are germinating on apple tissue. Germination doesn’t mean infection! 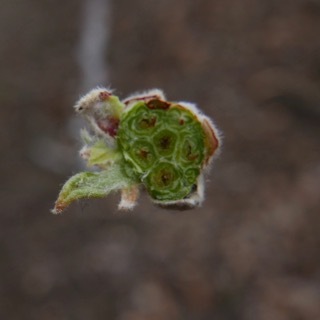 It takes awhile for the growing spores to actually get into the leaf. 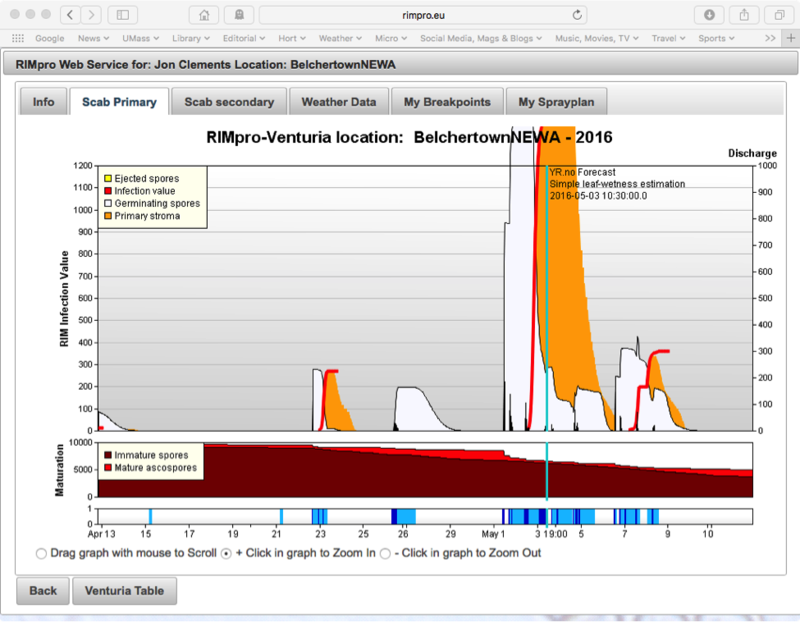 That’s shown by the orange areas, what RIMpro calls “Primary stroma”. These shaded areas are primarily useful for detailed spraying using organically approved fungicides, though they also indicate when post-infection conventional fungicides will be most effective. Another feature of RIMpro is that it estimates the amount of fungicide on your trees over time. It’s still rough, and the developers have said that it needs work, but the rough estimate indicates that there was plenty of fungicide present when ascospores were released and starting to germinate. This very detailed picture of this, the most important scab infection period of the year, the only important infection period of the year to date, tells us that it is time to use all the fungicide tools in the bag. The protectant fungicides will be significantly depleted by tomorrow. When the scab pressure is as high as RIMpro indicates, there’s always the chance that mistakes like poor coverage due to a plugged nozzle or gusts of wind will lead to infection. And there’s more rain and infection predicted for the weekend. So we will spray a systemic fungicide plus mancozeb in the test block during the predicted break in wet weather on Thursday or Friday. This is the kind of combined event that you save those post-infection spray applications for! The systemic plus mancozeb should give about 48 hours of post-infection control, while protecting against the forecast weekend infection. We’d love to tell you that its all smooth sailing after that, but with a large percentage of the ascospores remaining, we have the potential for a few more infection events of this magnitude before we can consider primary scab season to be over. Ed. note: See Dan Cooley's video below explaining more about how the RIMpro cloud works. Trees have been exposed to aberrant weather over the past several months. Reports in the area indicate varying degrees of damage to the spurs. This year the dominant factor in determining your chemical thinning approach starts with assessing flower and spur damage. Significant differences in size of flowers that are developing in the cluster. 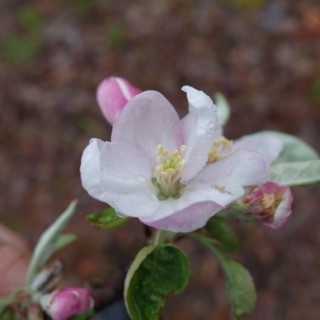 Misshapen petals on some or all of the flowers. 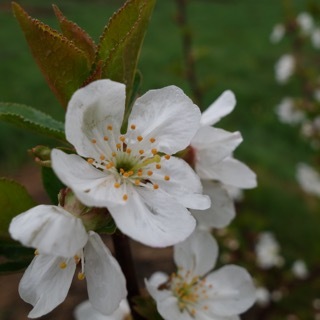 If more than occasional damage is observed then our suggestion is not to consider a blossom thinning spray. Generally, I recommend and strongly urge growers to apply a petal fall spray if pollination weather was good or at least acceptable and flower quality good. Generally thinning is not severe when application is made at this time and it does make thinning later easier. 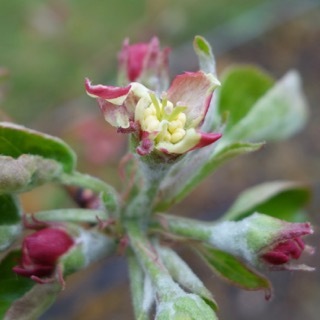 Even if there appears to be little flower or fruit damage I would suggest a conservative approach. Carbaryl or Amid-Thin are relatively mild thinners and would be good choices to use at this time on . Extreme care must be exercised this year, especially when depending on the Carbon Balance Model. Alan Lakso the developer of this model has indicated that extreme caution must be used this year with the Carbon Balance Model. This model was developed using data collected from healthy fruit and spur leaves. If leaves are small, crinkled and off color they have sustained damage, perhaps a significant amount. These spur will not be able to function to the same level as that of an undamaged spur. Consequently, we can’t depend on the veracity of the results it gives us this year. Alan Lakso suggests that it would be unwise to use it as a decision maker before the 6 mm stage, and after that use it with a reasonable amount of caution. It is an excellent tool for use on undamaged spurs but we are moving into uncharted water this year with this model. The Carbon Balance Model may be use as a rough guide during the 8 to 14 mm fruit growth stage. The Fruit Growth Model is based upon data collected from healthy fruit that are sizing normally. Trees have a self-regulating mechanism that result in a signal from fruit to abscise if sugars and metabolites are in short supply. 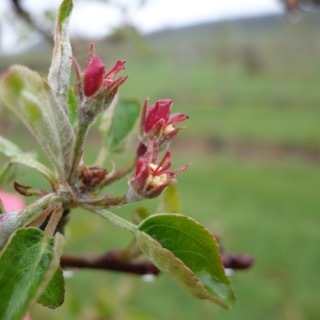 As unpopular as this Model is, because of the time commitment required, it is your best method to assess the effects of weather on the viability of developing fruit. 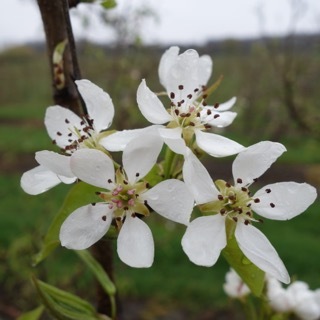 I am in agreement with researchers in New York, Poliana Francescatta and Terence Robinson in suggesting that use of this Model to determine the number of viable fruit that you have at the 8 to 10 mm thinning stage. Using the method, fruit should be marked and measurement started at about the 6 mm stage. It is important that after your initial measurement has been made you should wait a minimum of 4 days and better 5 days to measure again. Fruit that will drop show a reduced growth rate. The results of these measurements will provide you with sound information on which to base thinning decisions at the 10 mm stage. Those that do not want to do the whole protocol can tag fewer spurs. I have found that measuring fruit on as few as 15 spurs it is possible to gain a reasonable assessment of how many fruit will abscise and how many will persist. If this scenario is selected, I strongly urge you to do the measuring yourself. The whole process will take less than an hour. The weather is expected to remain cool for the reminder of the week. You should note that fruit do grow over a wide range of temperatures. 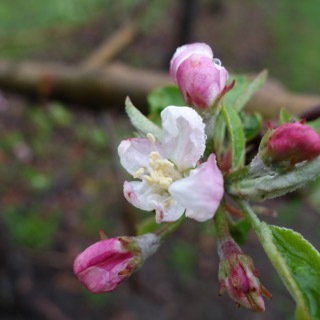 According to Ian Warrington, fruit in general increase in diameter 0.3 mm per day at 50º F, 0.6 mm per day at 60º F, and 0.8 mm per day 70º F., so even at relatively low temperatures you can expect fruit to increase in size if they are going to persist. Only fruit that grow will persist. 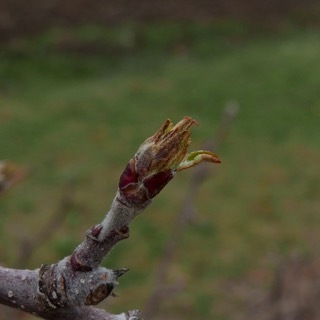 Last week we suggested that starting Apogee application early this year might be a good idea. 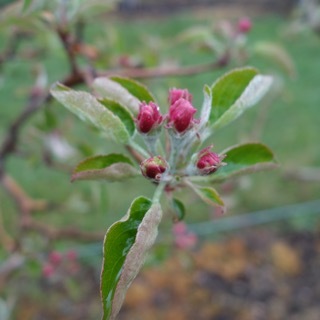 Our suggestion was to apply 9 oz/100 gal of Apogee starting at the pink stage of bud development. The advantage of an earlier application is to stop growth earlier and thus achieving greater terminal and lateral shoot growth control of the tree. This may as well enhance final set. Apogee does not increase set but rather it does retard drop. Although unproven, early application may prevent drop of weaker fruit that would otherwise drop during the early June drop period. Follow up application(s) of Apogee is suggested but perhaps at lower rates than the 9 oz rate. Ed. 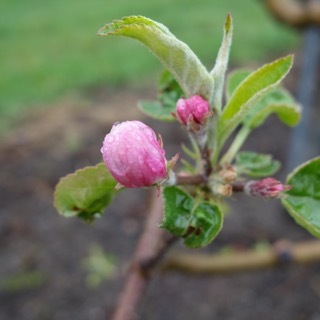 note: for more detail on the Fruit Growth Model and measuring fruit and using the spreadsheet to predict fruit set, see Thinning on Michigan State University's Apples/Horticulture page. 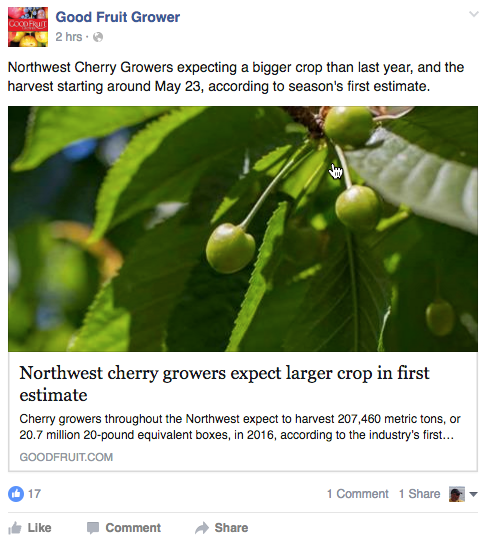 The next Healthy Fruit will be published on Tuesday, May 10 (or thereabouts), 2016. As always feel free to get in touch with any member of the UMass Fruit Team (http://extension.umass.edu/fruitadvisor/team-members) if you have questions or comments.